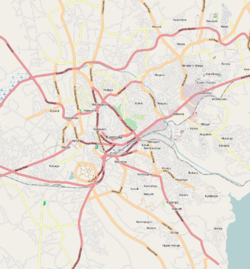 Mengo is bordered by Old Kampala to the north, Nsambya Hill to the east, Kibuye to the south-east, Ndeeba to the south, Lubaga Hill to the west, and Namirembe Hill to the north-west. 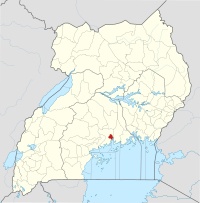 This location is approximately 2.5 kilometres (1.6 mi), by road, directly south of the central business district of Kampala. The coordinates of Mengo Hill are 0°18'06.0"N, 32°33'58.0"E (Latitude:0.301667; Longitude:32.566111). The peak of the hill is at 1,210 metres (3,970 ft) above sea level. Mengo Hill is the location of the main palace (known as Lubiri or Mengo Palace) of the Kabaka (King) of the Kingdom of Buganda, a monarchy that dates back almost 800 years. Mengo has been the main palace since it was first constructed in 1885 by Mwanga II of Buganda, the 31st Kabaka of Buganda. Measuring 0.9 square miles (2.3 km2), the palace is ringed by a six-foot brick fence and has a small airstrip within its walls. Mengo Hill has played an important role in Ugandan political and religious history. "Mengo" is a Luganda word for grinding stones. According to legend, ancient migrant communities from the Ssese Islands who settled on the hill used these stones to grind their food. It is here that the Buganda Agreement of 1900 was signed between the Kabaka of Buganda and British colonial officials establishing the Uganda Protectorate. The history of Mengo Hill is also entwined with that of adjacent Namirembe Hill, the seat of the Anglican Church of Uganda, because of the monarchy’s close association with the Church of England. The Bulange, which houses offices for the Kabaka and the Lukiiko (Buganda Parliament), is at the base of Namirembe Hill. The building was constructed between 1953 and 1958 by Muteesa II of Buganda at a cost of US$5 million, which was a colossal sum at that time. Also located on Namirembe Hill is Mengo Hospital, a private, non-profit community hospital administered by the Anglican Church in Uganda. The main palace of the King of Buganda, the Lubiri. The Kabaka's Lake, a man-made lake approximately 5 acres (2.0 ha), for the personal use and enjoyment of the Kabaka; located just outside the main palace entrance. The Joint Clinical Research Center - Located adjacent to the palace, the medical research center is housed in the Butikkiro, the former official residence of the Prime Minister of Buganda (Katikkiro). This building is one of Buganda's assets that have yet to be returned to the Kingdom. The main campus of St. Lawrence University (Uganda) - Located close to the Kabaka's Lake. Lubaga Hill - Immediately west of Mengo. The seat of the Roman Catholic Archdiocese of Kampala. Location of St. Mary's Cathedral Rubaga, built between 1912 and 1925. ^ "Map Showing Central Kampala And Mengo With Distance Indicator". Globefeed.com. Retrieved 19 June 2014. ^ Google. "Location of Mengo, Uganda Google Maps". Google Maps. Retrieved 19 June 2014. ^ UTG. "Profile And History of Mengo Hill". Uganda Travel Guide (UTG). Retrieved 19 June 2014. This page was last edited on 25 January 2018, at 19:47 (UTC).